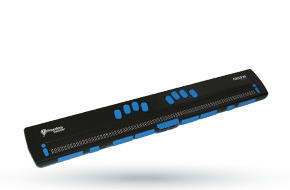 Freedom Scientific’s world-class refreshable Braille displays deliver brisk Braille input and output for your PC or mobile device. The robust Bluetooth® connectivity provides seamless use with Windows®, Mac®, iPhones®, iPads®, and Android™smartphones and tablets. Ergonomic navigation features allow quick, natural hand movements for greater productivity. When the Focus Braille displays are used with JAWS® screen reading software, they support our popular Braille Study Mode, an interactive tool for teaching and learning Braille. 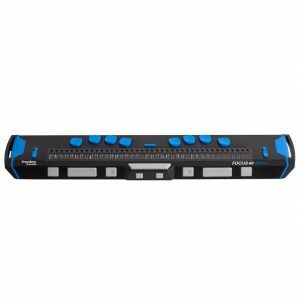 The Focus 14 Blue 5th generation is a compact and robust 14-cell braille display drop tested to MIL-STD-810G and ready to go with you anywhere. It features a comfortable user-friendly 8-dot keyboard and Bluetooth 4.1 and USB-C connectivity so that you can switch between five connected devices. Use it with your smartphone, tablet, or laptop, or use the built-in Scratchpad to take notes on the fly…perfect for your active lifestyle. The 5th generation of the Focus 40 Blue is a durable, lightweight braille display drop tested to MIL-STD-810G and designed to take on the challenges of every-day bumps and scrapes. Its user-friendly keyboard, convenient front panel controls, and retooled braille pins make for smooth and quiet operation. With Bluetooth connectivity for five devices, a built-in Scratchpad, a USB-C port, and tough, compact, portable design, the Focus 40 Blue ensures reliable operation whether you’re on the go at work, traveling the world, or simply relaxing at home. The Focus 80 Blue offers streamlined size and ergonomic control layout for natural hand placement and comfort during long working sessions. The USB and Bluetooth connectivity allow you to toggle between two connected devices. When used with JAWS, the ultra-quiet 8-dot Braille keyboard provides contracted Braille input and all keyboard commands for complete PC control.